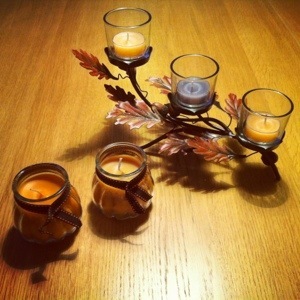 I also purchased small glass pumpkin jars that I will bring to Linköping and put in my new living room. I’m counting on at least a coffee table in the new place! Mathias will bring it for me next weekend when he visits me. I filled up on tea lights as well. I bought my favorite Fall scent Ginger pumpkin as well as a new one called “fire” something. It’s a grayish candle whereas ginger pumpkin is a darker orange. Now I’m ready for the cozy Fall evenings curled up in the sofa with a blanket and lots of candles! We have Partylite in Australia, too. They have such beautiful thing, albeit a little on the pricier side. They do have some lovely scents – my favourites are the wax melts as they make the whole house smell just edible! My favourite scent was Apricot Daisy but that has unfortunately been discontinued :(. Your Autumn Partylite decorations in the photo are just beautiful!